When a loved one is diagnosed with serious illness, the lives of those close to them are impacted as well. This is the beginning of a new journey for everyone and it may last months or years depending on the progression of your loved one’s illness. It’s important that you learn as much as you can about your loved one’s condition. The more information you have, the more in control you will feel. Talk with their doctors as well as do some of your own research. Find organizations that deal with their specific disease and seek them out for educational materials and to locate support groups near you. Daily routines may need to be adjusted due to the treatments your loved one is getting or limitations on mobility caused by their illness. Family members may need to share caregiving responsibilities to ensure that everyone has an opportunity to help, as well as taking the pressure off a single caregiver. 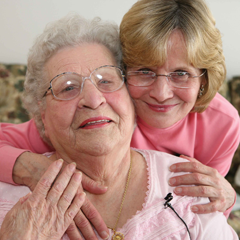 Family roles may change as others may have to take over responsibilities for the person who has assumed the role of caregiver. The behavior and appearance of your loved one may change as the illness progresses. For the person living with a serious illness, the type and level of stress will vary depending on their illness, their prognosis and the extent to which it affects their ability to function. Caring for a loved one while trying to maintain your day-to-day responsibilities can naturally lead to stress. The level of stress depends on your level of involvement and your relationship with the person. JourneyCare can help. We are here to provide the care and support you and your loved one need from the moment of diagnosis. We will be by your family’s side every step of the way. For more information or questions, contact us or call us day or night at 224-770-2489.